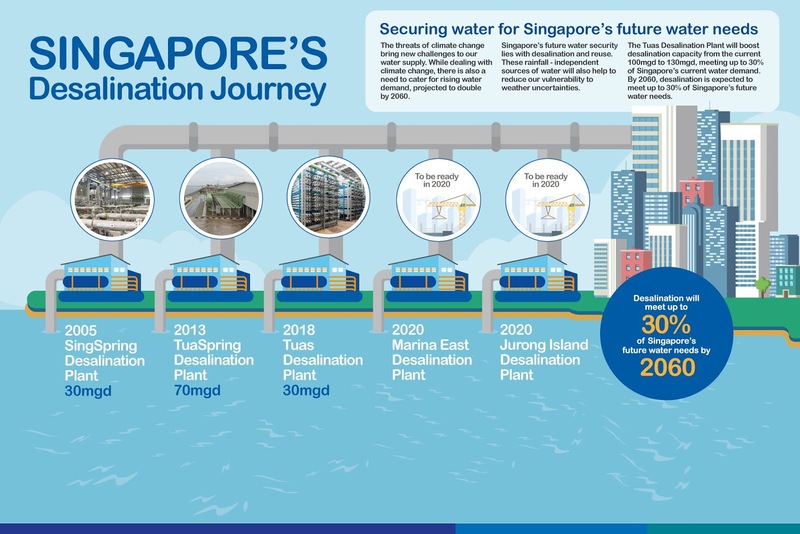 The Tuas Desalination Plant is the world's most space efficient in terms of the amount of water it can purify for its size, said national water agency PUB. At 3.5ha, it is the smallest of the country's desalination facilities, yet it produces 30 million gallons of drinking water a day, the same amount as SingSpring Desalination Plant, which is almost double its size. It took two years to build and opened officially yesterday. 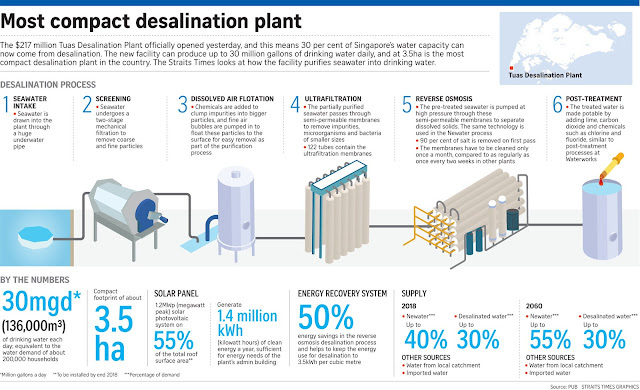 And now that it is running, 30 per cent of Singapore's water supply can be met through desalination. The $217 million facility will remain the smallest even after the next two desalination plants are built in Marina East and on Jurong Island by 2020. It is the first to use solar power, as well as the most technologically advanced. More than 7,000 sq m of the new plant's roof will be covered by a photovoltaic system and, when online, the solar panels can generate 1.4 million kilowatt hours of energy a year, enough to power over 300 four-room flats for the same period. However, in an indication of just how much electricity is needed for desalination, this is enough to run only the plant's administrative building - less than 1 per cent of the facility's total needs. The Tuas Desalination Plant combines two purification methods used separately in SingSpring and Tuaspring. By doing so, its reverse osmosis membranes - where the final stage of purification occurs - must be cleaned only once monthly, compared with as often as once every two weeks. Notably, this plant is the first to be owned and operated by PUB and, according to PUB water supply (plants) director Bernard Koh, will allow the agency to implement its own research and development projects. The water agency's chief executive Ng Joo Hee said: "Sea-water desalination has a starring role in Singapore's water future. And the opening of Tuas Desalination Plant is another milestone in our quest for enduring water security." He added: "Excitingly, it is a real-world test bed for the cutting-edge technologies PUB has been exploring in recent years in our ambitious bid to halve the energy used for seawater desalination." 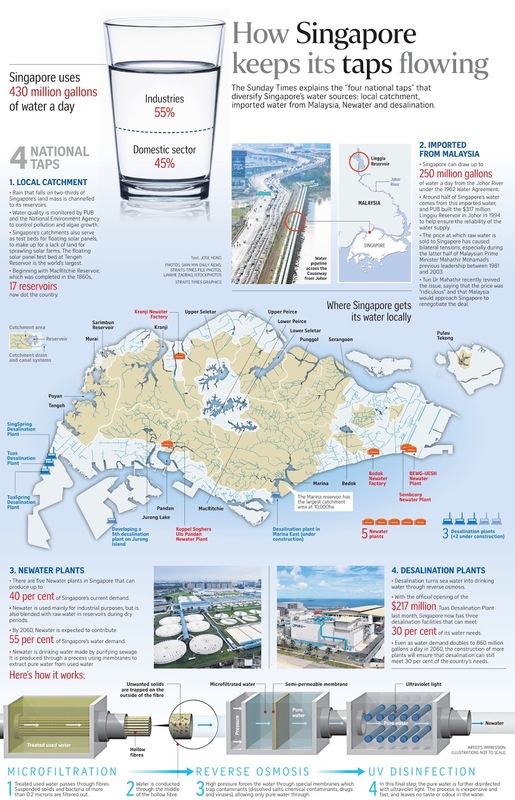 Barely a year after its opening, the Republic's Tuas Desalination Plant has won an accolade. The desalination plant - the first plant owned and operated by national water agency PUB - was named Desalination Plant of the Year at this year's Global Water Awards, presented at the Global Water Summit in London on Tuesday. The awards recognise the most important achievements in the international water industry, including improved operating performance, innovative technology adoption and sustainable financial models. The other plants in the running for the Desalination Plant of the Year category were Barka 4 IWP in Oman, Djerba in Tunisia and Galalah in Egypt. PUB said in a statement yesterday that the Tuas Desalination Plant marked a major milestone in Singapore's water sustainability journey. As the country's third desalination plant, the $217 million facility is Singapore's most technologically advanced plant, setting new industry benchmarks for its robust pre-treatment processes and reliance on clean energy, said PUB. The plant is housed in a 3.5ha facility, which is roughly the size of five football fields. It produces up to 30 million gallons of drinking water a day, which is equivalent to the water demands of about 200,000 households. Mr Christopher Gasson, publisher of media and events company Global Water Intelligence, which established the awards in 2006, said: "Tuas Desalination Plant... sets a new ecological benchmark and puts the PUB at the forefront of desalination plant development for decades to come in the region." PUB chief executive Ng Joo Hee said: "We are proud that the plant has been recognised by our peers, and even prouder that it is providing Singapore with high-quality drinking water and enduring water security every day." The plant is housed in a 3.5ha facility, which is roughly the size of five football fields. Other categories at the awards include Water Company of the Year, Desalination Company of the Year and Public Water Agency of the Year. Last year's winners were the Mirfa IWPP in Abu Dhabi and the Jazan IGCC desalination plant in Saudi Arabia for the Municipal and Industrial Desalination Plant of the Year categories respectively. This is not the Republic's first win at the awards. Last year, the Ulu Pandan wastewater treatment project, designed to pilot technologies for the new Tuas Water Reclamation Plant, won Water/Wastewater Project of the Year.